Since there is just little over a month left till this year’s Worldwide Developers Conference, I thought it would be a good idea to sit down and write a simple guide for people who are attending the conference for the first time. You’ve wished to get there for years, you might have missed the ticket sales last year (or the years before that), but now you’ve won the ticket lottery (or student scholarship) and you just can’t wait for the whole experience. You feel like a kid before Christmas! Am I right? You also probably want to get the most out of it, and that’s where this blog post comes in. 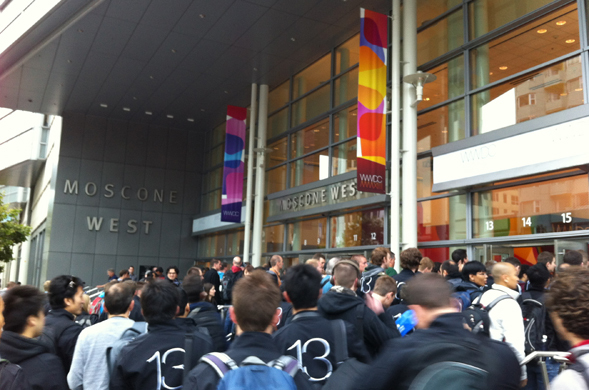 I was lucky enough to attend the WWDC last year (more about that here), so I have some experience with it. I am aiming to include here all the tips and tricks I wish I’d known before my first “DubDub”, and I hope it will be helpful for you. So, sit back, get a cup of coffee, make yourself comfortable and then get back over here. I’ll be waiting. You most likely have both taken care of already, but in case you haven’t, I suggest you book a hotel and buy the tickets as soon as you can. It will only get more expensive if you do it later. Flight is obviously very location-specific so I won’t be covering this here. Hotels are very expensive in San Francisco (at least for me, a middle-European citizen). If you are on a tight budget, this might be an issue. But don’t worry, if you are willing to lower your standards a little bit, there are some cheaper options (emphasis is on the cheaper – they are not cheap by any means). As for a booking service, I have a good experience with booking.com. Average price for 1 person per night is about $130–$150, and the cheapest ones are around $60–$70. I suggest you find something within walking distance from Moscone Center (the conference building where WWDC is held). Keep in mind that you’ll be walking this several times a day, so distance really matters. Closer is obviously better, but 2-3 blocks should be fine. Last year, I stayed at the Pontiac Hotel on 6th Street. I knew nothing about it when I was booking the hotel, but when I got there, I noticed there was a large concentration of scary-looking people, usually in groups. And when I talked about my hotel location with some people who actually know the SoMa area, they were like, “Really? That’s the worst district here.” I have to admit, I didn’t feel very safe there. I witnessed a bust with two police cars, an angry homeless man in a local Subway and some people offering me drugs. I had a tactic when facing those “gangs”: don’t make eye contact, and try to look confident when you are walking past them. They didn’t bother me personally, not once. So if you want to be just two blocks away, you are on a tight budget and you don’t mind feeling little unsafe, Pontiac can be a great choice. I personally think that San Francisco has the best weather on the planet. With the city’s average temperature around 21°C and most of the days sunny, I can’t really ask for better. Combine it with the half-salty air from the sea around, and you experience something that’s a joy to breathe. But maybe that’s just my view. Anyway, the temperature I was mentioning is the daily high. The evenings are usually quite cold, and even more so when it’s windy. I would suggest a wind-proof jacket for the evenings, and a sweat-shirt for the afternoons. Around noon, it might get so hot that even a T-shirt is too much. The difference is really that big. Take a look at this Wikipedia page to learn more. If you are on a tight budget, I suggest you take the subway (BART) from the airport to the Civic Center area. As for sightseeing, probably the best means of transport are buses and walking. The bus lines in San Francisco are quite complicated, so what I used to do was find a bus station and get on any bus that arrived, and I asked the driver what buses I should take in order to get to my desired location. They were usually happy to help. That’s actually what I loved the most about San Francisco, the vast majority of people I encountered were super nice. If you are not on a tight budget, you can obviously take a taxi. Or, for the hotel–airport route, you can use a shuttle. These shuttles are taxis for multiple people, and therefore are cheaper than a private cab. Your hotel should be able to book one of these for you, or you can do it yourself. I have had a very good experience with SuperShuttle. You can pick up your badge on Sunday or on Monday morning. I highly suggest you do it on Sunday if you can, because on Monday you’ll most likely be in the line for the Keynote. The badge is your entry pass to the building, so it’s extremely important that you don’t loose it because they won’t give you a new one. Put it somewhere safe. Personally, I put it on a hook inside my backpack and only brought it out during the entry check. 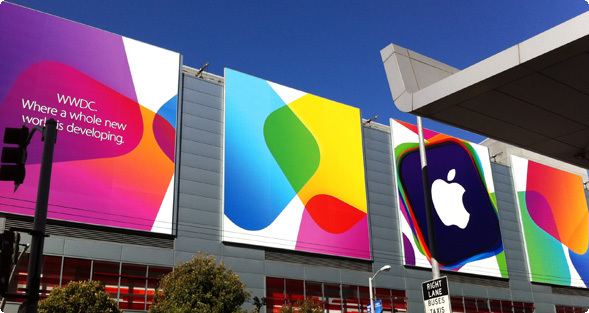 As you probably know, Keynote is the main event of WWDC. It’s the event where Apple introduces new products, new system versions and other new innovations. It’s also the event where people would try to sneak in live-streaming cameras back in the days when Apple didn’t do a live stream themselves. Because five thousand people won’t fit inside the room and because a lot of people want to be near the podium, there is always a long line to get inside. The famous saying that you can’t get there too early is absolutely true in this case. Last year, some people started waiting on Sunday morning, which is absolutely crazy. Personally, I got there at 4:45 a.m. and I managed to be in the first third of the Keynote room. It all really boils down to how close to the podium you want to be, and how much sleep you are willing to sacrifice for it. Apart from waiting, the line is an experience in itself. You can meet and talk to other developers waiting around you, and you can get some free stuff from all the marketers there. In the morning, around 7 a.m., Apple employees are handing out free coffee and muffins. Plus, everybody is so full of anticipation that you can almost feel it in the air. So don’t be afraid that you’ll be bored during the wait. One of the events of the first day is usually ADA (Apple Design Awards). Apple awards developers of their choice whose apps have great design. I would highly suggest going there; it’s a great experience. After the last event of the first day, you might want to go the dining hall and download pre-release versions of iOS and Xcode on their super-fast cable Internet. Seriously, if I recall it right, it had around 800 Mbit/s. Last year, I made the mistake of going back to Moscone too late and it was already closed, so I downloaded and installed it the next morning during breakfast. But because the installation was taking too long, I missed the beginning of the first session and I ended up in the overflow room. Believe me, you don’t want to end up in the overflow room. It’s like watching last year’s session video with 200 other people – it’s weird. I won’t be talking about the contents of the sessions because these are strictly under NDA, but sessions in general are obviously the main part of WWDC. These are where you’ll hear about all the great new stuff, and how to make use of it as an iOS/Mac developer. You’ve probably watched some sessions already, but believe me, it’s nothing like seeing it live. 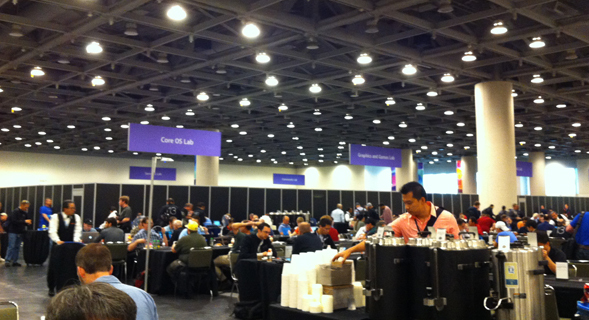 All the most important sessions take place in the biggest Moscone Center room, Presidio. In the morning, make sure to be there at least 15 minutes before start of the first session. They have a sophisticated queuing system, and when you get to the third floor, you’ll be ‘enqueued.’ Then, they let people in from the various queues in the order they were created. If you come in just minutes before start of the first session, you are guaranteed to get in late. In addition, your queue might even be sent to the overflow room if Presidio gets full (just as happened to me on the second day). Now, these queues are not just a morning thing; they are created before every Presidio session. So once you get inside, it’s smart to not leave if you plan to attend the following session there. Another tip: if you are going to the sessions on your own, don’t be discouraged if the room seems to be full. Just go to the front and take a look for free seats in the middle in front of the podium; there are usually couple of those free, waiting to be discovered by someone like you. This way, I managed to have great seats for most of the sessions. The lab at WWDC is a place where you can talk directly to an Apple engineer about your particular programming/framework problem/inquiry. I highly suggest you go there, because it’s a unique opportunity to get your questions answered by the person who created it! You can also get marketing or user experience advice there. But beware: there are long queues for the more popular labs, like App Store or marketing labs, so you might need to sacrifice a session for it. Even so, I still think it’d be worth it. There are multiple unofficial parties on each evening of the WWDC week, and it’s definitely a great idea to go to as many of them as you can. The page wwdcparties.com had a good list of them last year, and they’ll probably update it for 2014 soon. On the Thursday, Apple traditionally hosts its own party called Bash, for WWDC attendees only. They invite a band and give people beer and food. It takes place outside, in Yerba Buena Gardens. There you can meet some very interesting people and headhunters there. If you are under legal age in U.S. (21), you might want to ask someone to bring you the beer, just like I did last year with my friend Eduardo Roman. If you should go to just one party during the week, it’s this one. Talk to as many people as you can! Seriously, even if you don’t feel comfortable doing so (I am a shy guy, so I know). Most of the people there are nice and they want to talk too! They’ll be glad you broke the ice and started chatting first. Make sure you have your business cards within easy reach so you can hand one out when appropriate. This directly implies that you should have business cards. There is still time, so get them – really. A couple of years ago, they went from catered lunches to refrigerated lunch boxes, and this year probably won’t be an exception. It was okay with me, but if you are willing to spend a little extra, there are a lot of good places to eat near Moscone Center. Another suggestion: change your profile picture on Twitter to a real photo of you, so if you are meeting with someone, they can easily recognize you. Obviously, what else could be at first place! I suggest you rent a bike and ride it over the bridge. Bike is actually also great for getting around San Francisco fast. That was an amazing experience. Their audio tour can really drag you in, because it will tell you a lot of interesting facts about Alcatraz from times when it was federal prison. There are also rangers making tours for free on the island and talking about Alcatraz history in an interesting way, so I suggest you take a tour with one of those. You have to book your boat trip to Alcatraz about a week in advance during the summer period. I suggest you leave a full afternoon for it so you don’t have to hurry back. 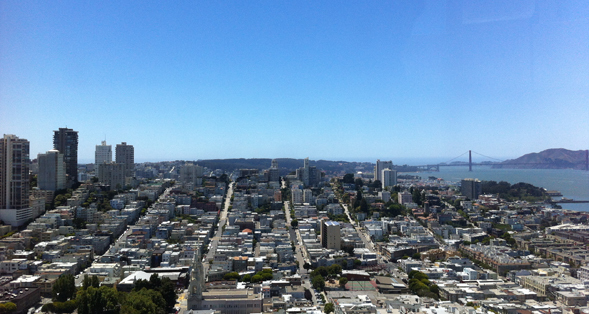 This tower has one of the best views of San Francisco, but you have to pay to get to the top. It costs about $10, but it’s definitely worth it! If you are fan of the Beat generation, you should definitely go to see where it all started. This one you probably won’t find in the top spots of travel guides, but I included it here because I had a magical moment there. Imagine that: the salty air, the wind blowing gently, dogs playing, the sun… It was soothing. I suggest to just going there, sitting on the bench for a while and just enjoying the moment. As for a guidebook, I have good experience with the one from Lonely Planet. If you can’t decide whether to spend your additional tourist days before or after WWDC, I highly suggest the first. Last year, I was in San Francisco for an additional six days after the conference, and I think I would have been better off doing it before the conference, for one simple reason: you are so excited by all the new stuff at WWDC that you want to try it right away. You also have it all in fresh memory so the learning will be much faster. Plus, you’ll get adjusted to the time difference for the WWDC week if you get there a couple days earlier. I really hope this guide will be useful to you. If you’ve been to WWDC yourself and find something missing, or if you are a first-timer and you’d like to know something more, don’t hesitate to let me know in the comments. If you’ll be going this year, I wish you a great time! And if not, best of luck to you for the next year! Hey Björn, thanks for your comment! I’ve looked into AirBnB too when I was looking for a hotel last year, but most of them were quite expensive, $100+. And Lyft – that’s interesting, I’ll consider using it too (if I get the scholarship, of course 😀 ).